Over the past few years, consumers have been looking for products containing natural rather than synthetic food dyes.1,2 In response to this trend McCormick & Company, Inc. has recently released Color from Nature food colors, which are advertised as “colors made from plants, vegetables, and seeds.”3 A box of Color from Nature contains three packets of powdered dyes: Sky Blue, Berry (red), and Sunflower (yellow). I recently purchased a box from a local store and spent some time investigating and experimenting with these dyes. Wow! These natural food dyes provide avenues for a whole host of interesting, yet easy-to-perform chemistry experiments and demonstrations! I will be sharing many of these explorations with you in a three part series. In this post (Part 1) I’ll be sharing a bit about the chemistry of the Sky Blue food color, along with some experiments and demonstrations that are possible with this food color. Spirulina (a blue-green algae) is listed in the ingredients for the Sky Blue dye. Spirulina contain phycocyanin, a protein found in plants. This water-soluble protein does a good job of absorbing wavelengths of light in regions that chlorophyll does not. This helps plants to absorb extra energy from sunlight. Phycocyanin has a beautiful, deep blue color that primarily arises from the pigment phycocyanobilin (Figure 1). Figure 1: structure of phycocyanobilin, a pigment in phycocyanin that is responsible for the blue color in spirulina. The pigment is attached to the phycocyanin protein via a cysteine residue. The phycocyanobilin moiety is attached to the phycocyanin protein through a cysteine amino acid. As you can see in the video above, metal ions bind to the phycocyanobilin moiety (Figure 2), and this quenches the fluorescence of the protein.4 I observed this to work using both Ag+ and Cu2+ ions (see video above for tests using Cu2+). What is interesting about this protein is that when it is denatured, the blue color diminishes and in some cases completely disappears. Likewise, the ability of the protein to fluorescence also decreases when it is denatured. Thus, the use of McCormick’s Sky Blue food colorant provides simple ways to demonstrate protein denaturation that involve a drastic color change from blue to colorless! You can see some of explorations of denaturing phycocyanin in the video below. If equipment is available to do so, it is very easy to do some simple spectroscopic experiments with Sky Blue dye. The absorption spectrum of Sky Blue dye dissolved in water is displayed in Figure 3. Consistent with the blue color of the solution, the absorption spectrum peaks in the orange region. The spectrum observed is consistent with previously reported absorption spectrum of phycocyanin in the dye.5 Thus, it is likely that this protein is responsible for the blue color observed in Sky Blue dye. Figure 3: Absorption spectrum of McCormick Sky Blue dye dissolved in water. By shining a violet laser pointer at a solution of Sky Blue dye, I was able to acquire the emission spectrum of the dye (Figure 4). The spectrum is clearly consistent with the red color of fluorescence observed. 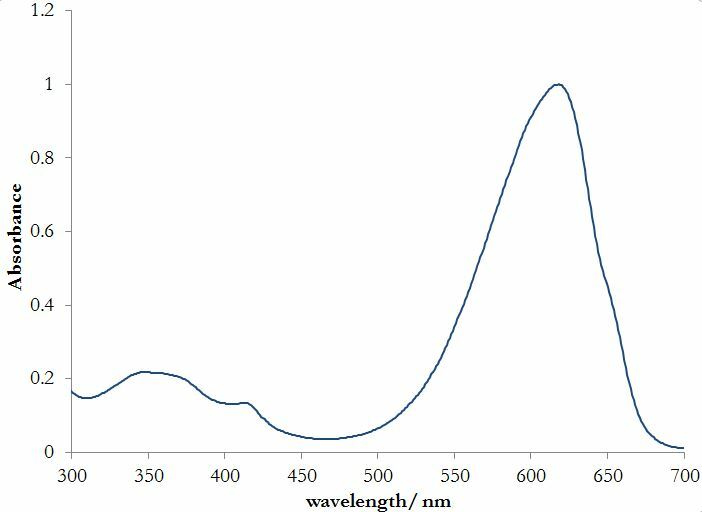 Once again, the structure of the emission spectrum was consistent with previously reported fluorescence spectra of phycocyanin,6 further confirming the presence of this protein in Sky Blue dye. Figure 4: Emission spectrum of Sky Blue dye in water excited with a laser pointer (405 nm). As you can see, there are a remarkable number of simple experiments that can be done with the Sky Blue dye found in McCormick’s Color Nature food colors. Be sure to comment if you try out any of these experiments - or invent any of your own to do - with this fascinating dye. In about a month, be looking for part 2 of this series in which the chemistry of the Berry dye will be explored. 4. Gelagutashvili, E.; American Journal of Biomedical and Life Sciences 2013; 1, 12-16. 5. Taylor, A. T. S.; Feller, S. E. J. Chem. Educ. 2002, 79, 1467 – 1470.